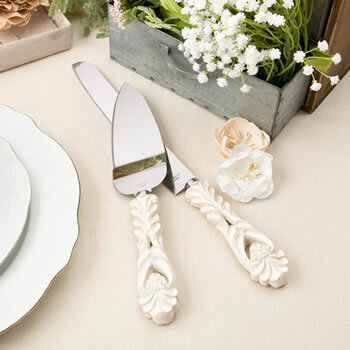 Serve up your designer cake using a stunning vintage style cake knife and cake server. This magnificent set is crafted with poly resin handles in an antique vintage style with a beautiful open flourish design. The handles are hand painted in an antique ivory color and finished off with subtle gold leaf accents. 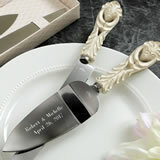 The blades of both the server and the knife are manufactured from stainless steel and have serrated edges. This is the perfect gift for someone who loves baking and entertaining! Size of cake server 10.75" x 2"
Size of cake knife 13" x 1"
A fabulous gift for someone who loves baking and entertaining! I'd give it 4.5 starts. For $20- can't beat it. It matches our rustic look. Only thing I would complain about it the engraving is kind of small. Otherwise, it's perfect. I'm not a cake person so I don't need a crazy expensive set for life !